Don’t forget: If you follow us only through emails or Facebook links, you’ll miss the updates on mileage that are posted every night in the blog sidebar. Go to rideforhumanrights.com for the latest. 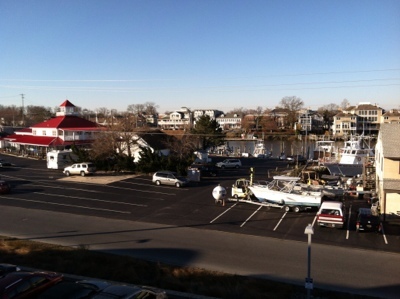 Here are some views from the roof of the Hotel Blue in Lewes, DE. 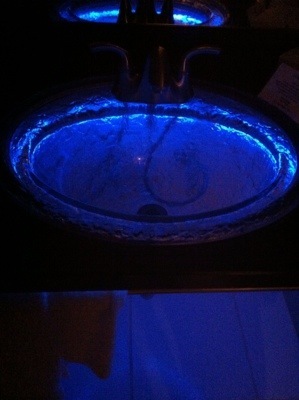 And the blue-lit glass sink will give you an idea of how nice it is. We enjoyed our brief stay. It was a beautiful day. Sun and clouds. Strong headwinds at times, but we roll with the punches. We passed this sign on our way out of town. 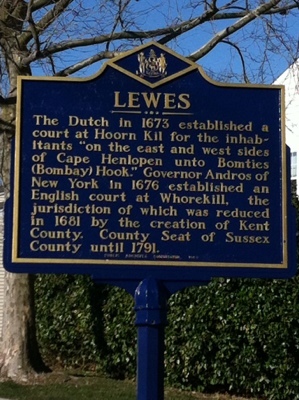 Note the remarkable English place name. 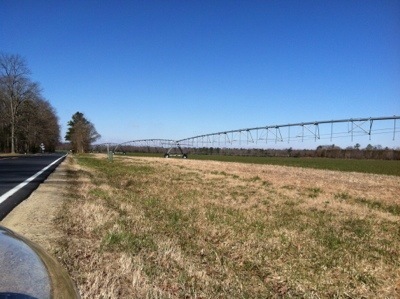 Southern Delaware and this bit of Maryland are agrarian. 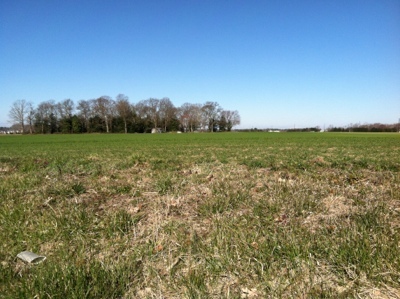 These fields constitute what some say is the human ideal of a perfect landscape: open space (so you can see tigers approach) and trees (indicating water and providing shade). Like many of our instincts, this one can be for good (allowing for agriculture) or ill (encouraging ecologically harmful Superlawns). Ditto for our natural preference to be with people similar to us; it can foster community, yet it can lead us to mistreat strangers. It’s a constant struggle to build and maintain a civilization that channels these impulses in constructive ways. 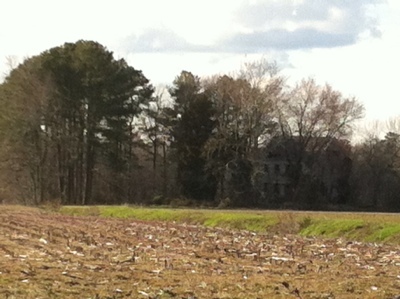 Late in the day, we saw this wreck of a Maryland house in the distance. It looks spooky and ancient, at the end of a long muddy drive. 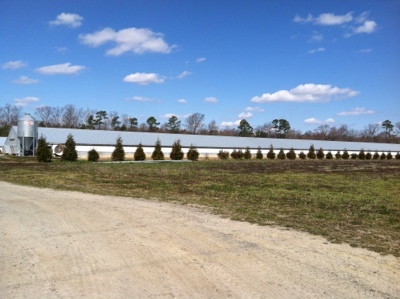 Was it abandoned because of the nearby chicken farm – the one that sells to Perdue and has a prominent sign banning visitors? Ah, chicken farms! Here is the first one we noticed . . . from downwind. It smelled bad but we soon moved upwind. Pity the people who live near these farms and can’t move. But people eat chicken, birds create smells, the dirt has to go somewhere, and the many DE and MD poultry farms are important to the local economy. There is no free lunch. 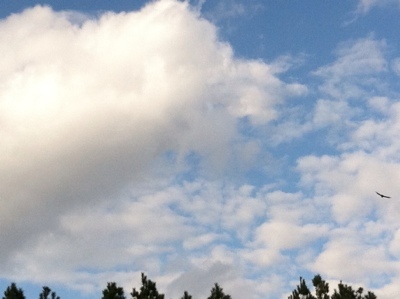 – or over a 6″ dropoff that could overturn bicycle or tricycle. Birds! 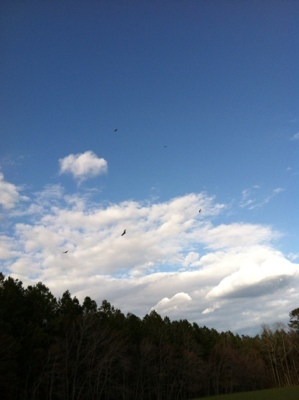 Jeffrey counted 12 soaring hawks in one group, and we saw many groups of hawks today. And deer in various states of decomposition – we roll close to the ground, ideal for spotting deer rib cages, some bearing or containing meat or hide, some picked clean but still 3-dimensional. 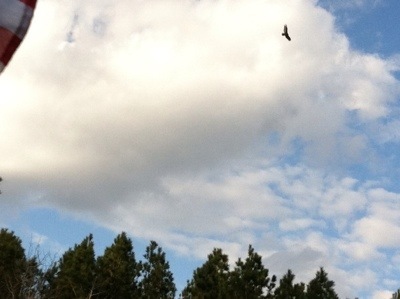 And turkey buzzards, which flapped away from a roadside deer carcass as we approached. And chickens and geese roaming free on a farm. And songbirds, most of which we could not identify, aside from the distinctive calls of redwing blackbirds and crows. 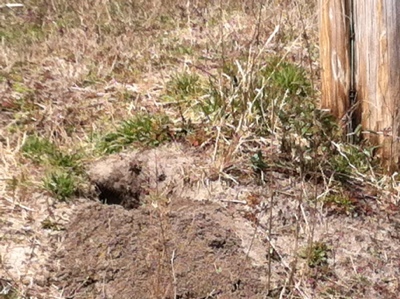 A woodchuck popped out of this hole. It went back in before Jeffrey could take its picture. It was a good-sized critter. Wish you could have seen it. 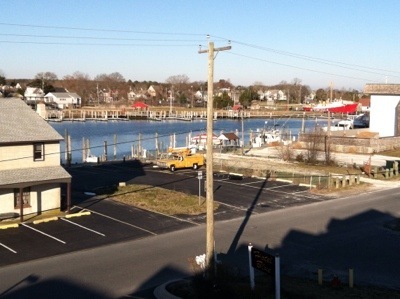 Meet Rick, a gentleman from a small town outside Salisbury, MD, who admired the Sprint 26. We had a nice discussion about recumbent bikes and trikes, local accents (do they change along a continuum as one travels, or are there decisive breakpoints along the way), and the beauty of NYC’s Governors Island (where Rick did some of his Coast Guard training). And we talked about Human Rights First defending refugees and trying to choke off the supplies that enable oppressive regimes to create refugees. 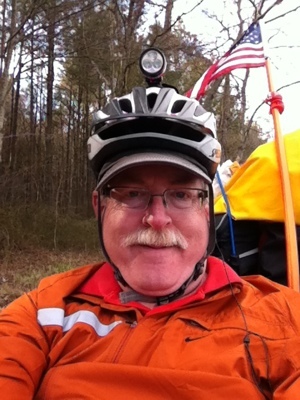 We hope Rick follows the Ride, and that we meet him again on the road on his own recumbent. 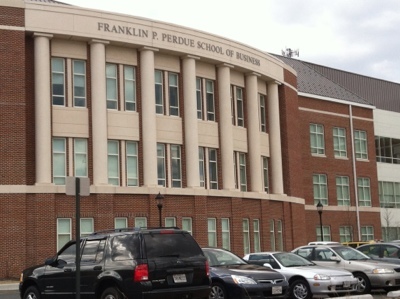 This business school was named for that Frank Perdue. So was the adjacent law school. 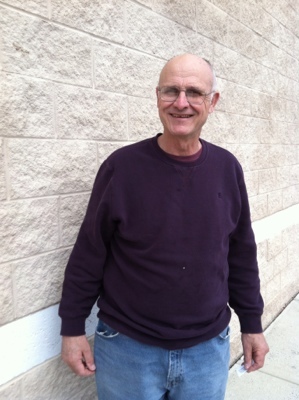 The late Mr. Perdue was from Salisbury, where he attended college. Ground controller Nancy said we need more photos of us. 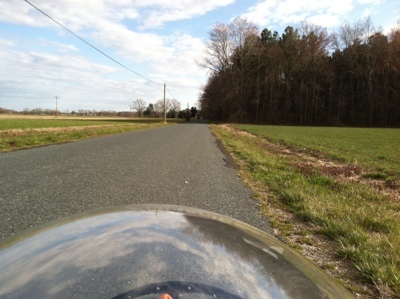 Jeffrey was too lazy to get me out of my plastic bag, so you’ll have to make do with this self-portrait, made aboard the Sprint 26 along a flat, winding, quiet road, hypnotic in the beauty of its trees and the sounds of its wildlife, that stretched for miles between Salisbury and Pocomoke City. 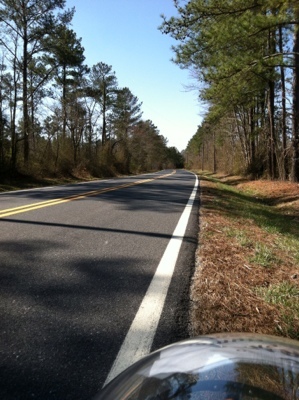 This entry was posted in Bicycle Touring, Chicken farms, Human Rights, Tricycle touring by Joey. Bookmark the permalink. Ride on Jeff….You’ll be in Virginia before you know it and more miles and miles of flatland…And good temps the next couple days. Hey Jeffrey you are ridi.g through my home stomping grounds right now. Enjoy!